The following is an extract from the “Encyclopaedia of Rare and Famous Stamps” by L. N. Williams, volume 1, p.110-111. Great Britain’s official stamps properly so called is the series of Government Parcels of Queen Victoria – issued between 1891 and 1900 – which contains a one shilling value in green and carmine put into use in November 1900. In error some one shilling stamps had the overprint inverted. That stamp of which only a few examples, all used, are known, has a curious history. The error was discovered independently soon after the stamps were issued by the Rev. A. Ogle and Nicholas J. Heller. They must have reported it to H. L’Estrange Ewen because, when he wrote an article about the stamps in his paper, Ewen’s Weekly Stamp News, soon afterwards he omitted to mention the error and they remonstrated with him. He mentioned that fact in the issue dated 24 October 1903. The error was then listed in Stanley Gibbons’ catalogue in 1904. It remained listed until 1916. In April 1915, five examples of the error were submitted to the Expert Committee of the Royal Philatelic Society, London but certificates of opinion of authenticity were refused. The errors were, accordingly, virtually condemned as forgeries. The catalogue omitted the listing and inserted a note stating: “The inverted overprint on the 1s … only exists as a forgery”. That note remained in many subsequent editions of the catalogue. In 1947 H. R. Harmer examined six of the stamps with inverted overprint and reviewed the known facts of their discovery, piecemeal in parcels of normal stamps, with a cost price of nil or thereabouts. He wrote an article published in January 1948 in The London Philatelist vol 38 pp 83-88 and The British Philatelist February 1948 pp 91-95. He illustrated the six examples and argued strongly in favour of their being genuine. ‘Vital New Evidence’ was the subtitle of an article by Nicholas J. Heller titled “One Shilling Green & Carmine ‘Govt Parcels’ with Inverted Overprint”, which was published in The British Philatelist vol 40 pp 83-84 January 1950. The author, while living in Plymouth at the beginning of the century, had been friendly with one of the engineering staff of the GPO Telegraphs – a linesman who frequently received official parcels franked with Govt. Parcels stamps which he gave to Heller. One morning Heller met the linesman who had a parcel which he had just collected from the GPO. Oh, he said, you want this, don’t you? He ripped off the address label bearing the one shilling stamp. It was not until Heller reached home that he looked at the stamp and discovered that the overprint was inverted, the stamp being tied by the cancellation to the label. A short while afterwards he went to Penzance and, while he was there, he was given a small box of Govt. Parcels stamps by another linesman. In it was another example of the inverted overprint, but the stamp was torn nearly in half. On his return to Plymouth, Heller was given ten shillings for the torn stamp by F. G. Rowe, a collector friend. 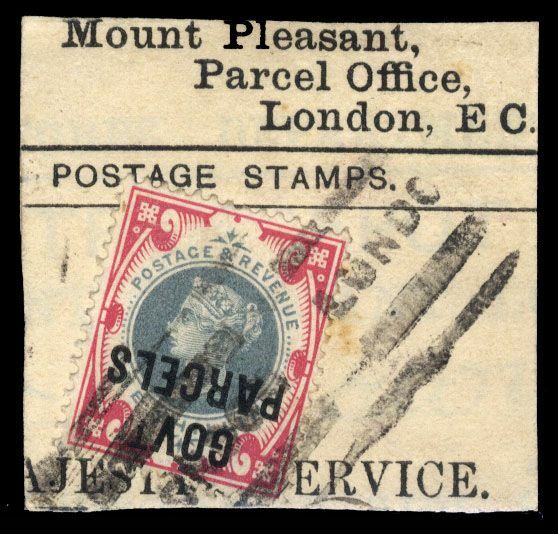 …being in want of a few pounds to pay my removal expenses, I offered the stamp to a gentleman in London for £3 ! ! ! What a ‘Simple Simon’ I must have been! I cannot remember the name or the address of the lucky buyer, but anyway he paid my price and I can’t complain. About 12 months afterwards I saw in Stamp Collectors’ Fortnightly that such a stamp had been sold at auction for £30. In The British Philatelist vol 41 P 88 January 1951 appeared a paragraph to the effect that the publishers of the magazine had received a certificate from the Expert Committee of the Royal Philatelic Society, London that in their opinion an example of the one shilling Govt. Parcels with inverted overprint was genuine. The Committee’s decision of 1915 was reversed. It can now be expected, the paragraph continued, “that the error will be restored to its place in Stanley Gibbons’ catalogue”.